You can’t help but laugh at those facial expressions – they say so much more than words! 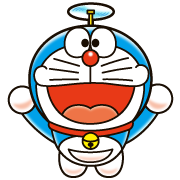 Get these stickers featuring Doraemon and all his friends! How to get LINE animated stickers GIF and transparent background on LINE sticker? Brown Drives in LINE Taxi Stickers!